Hummer’s 2004 advertising campaign included a television commercial, “Toboggan”, directed by no other than Kathryn Bigelow, the winner of Best Director award at the 2010 Academy Awards. A man and two boys accelerate down a snowy mountainside slope, heading recklessly toward peril, accompanied by a track from the movie, How The Grinch Stole Christmas. The camera follows the tracks back up the mountain to show us how they got there in the first place. 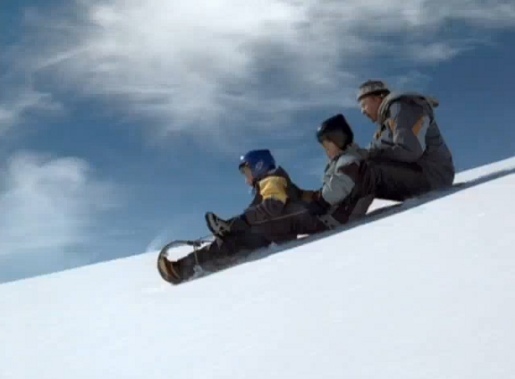 The Toboggan ad was developed at Modernista! by executive creative director/art director Gary Koepke, creative director/art director Tim Vaccarino, executive creative director/copywriter Lance Jensen, creative director/copywriter Joe Fallon, agency producer Julian Katz, executive producer Charles Wolford. Filming was shot by director Kathryn Bigelow via Independent Media, Santa Monica, with executive producer Susanne Priessler and producer Dominic Ferro. Editor was Hank Corwin at Lost Planet Editorial. Graphic design was produced at Brickyard VFX. Audio post production was done at Soundtrack. VFX were produced at The Mill by Flame artists Angus Kneale and Geoff McAuliffe, post producers Verity Grantham and Kirsten Andersen. Music was composed by Albert Hague and Theodor Geisel.